DYFFRYDAN 2013 PROMO - WATCH NOW! area of natural beauty in Southern Snowdonia near the market town of Dolgellau. Despondent Productions would love to see Dyfrrydan host the 2013 Subaleague International Christmas Cup, in its 25th year. The 'front' and 'top' fields are clearly visible here. The front field is to the right of the barn. 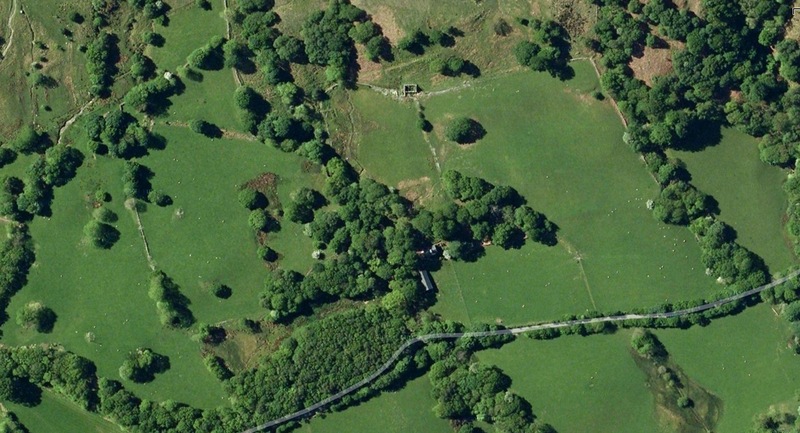 The top field is behind the cottage, below the broken down old house. 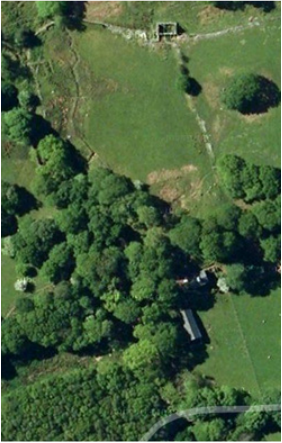 Partially covered by foliage, the cottage is at the top of the front field; facing the road, which can be seen running through the bottom right corner of the image. At the cottage end of the top field a marquee will be erected. This will provide cover for campers and their camping stoves in the event of anti-social weather. A further two marquees will sit either side of the barn, one under the trees on the left and another in the front field on the right. There is an option for one of these marquees to host a chef-run barbeque grill with freshly prepared salads. Dyffrydan provides a perfect stage for bands. Despondent Productions hope to put on at least one band but we are certain that Dyffrydan would be a fitting venue for the 2013 Christmas Cup, either way. restricted. There is no curfew. The cottage has a large kitchen, useable by all and well-equipped for large numbers. Despondent Productions is in negotiations with several bands in the hope of getting at least one to appear at Dyffrydan 2013. Were this to happen, the upper floor (bedrooms) of the cottage would become a 'backstage' area, reserved for band/s, crew and equipment. If no band materialises the upper floor becomes available for Suba entrants. Either way, the bathroom and kitchen remain communal. It is hoped that entrants would make a weekend of it and stay at least one night. The facilities are in place for a large gathering - though not one dependent on remaining in a large group. Aside from climbing Cader Idris itself, there are many walks to be taken, either driving from the cottage or from straight out of the front door. Harlech Castle (pics) is a short distance away, while locally there is a choice of peaks (Snowdonia Guide, Trekking Britain, Walking Britain, Torrent Walk) and lakes, or the beaches of Fairbourne and Barmouth, Fairbourne with its famed steam railway and Blue Lake, Barmouth with its arcades, mini-funfair, sandy beaches and fresh cockles. Bicycles can be hired in Dolgellau. It is 10 miles to Barmouth from the bike collection point and the whole route can be cycled traffic-free, on the former railway track that runs along the southern edge of the spectacular Mawddach estuary, now a multi-purpose track for hikers and cyclists. The track ends where it meets the railway bridge adjoining Fairbourne with Barmouth. Crossing the bridge affords a wide choice of pubs and eateries, perfect for cycling-induced hunger - though I could never see myself driving there for no other reason than to eat. Productions wins the tender to host the 2013 Christmas Cup there will be fireworks - of the display nature, naturally. More details to follow as the 2013 Christmas Cup approaches. Watch the Despondent Productions Dyffrydan 2013 Promo in full HD now! If you would like to know more about the Christmas Cup watch this or this. If you would like to know more about Despondent Productions' bid to host the 2013 event click here.